Made to measure in the UK using Speedflex infused GRP panels. A lightweight door suitable for a wide range of applications and available in made to measure sizes up to 2500mm(w) x 3000mm(h). Request a quote below or scroll down for further details. Dual action SS304 and 316L stainless steel hinge systems offering 90° hold or return or 270° swing options. Our GRP panels provide a lightweight, robust and durable finish. Our resin infusion process guarantees maximum performance from each panel. All of our doors are available with a range of food safe UHMWPE machined bumpers or optional heat draped teardrop bumpers. All doors are available with upper vision windows and optionally low level DDA windows. All doors incorporate pre-drilled hinge plates or fixing spines. This allows each door to be fitted without a sub-frame into suitable substrates. Machined fixings, post treated springs & precision engineered panels are standard on all doors. Using quality components and a high quality, versatile and robust door panel ensures our GRP doors perform exceptionally in a wide range of applications. 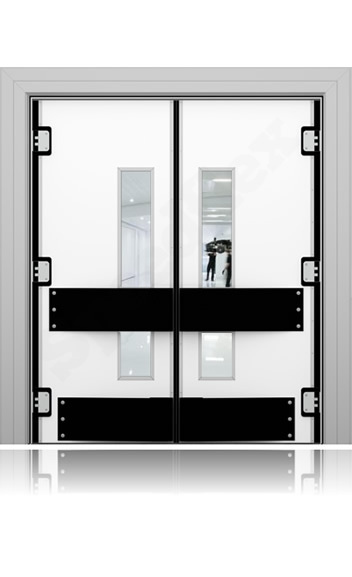 From Warehouse, Retail, Food Manufacturing, Commercial or Industrial, our doors are designed to perform. Our Stainless Steel dual action hinges are designed to provide trouble free, reliable & smooth dual action operation. Speedflex manufacture all GRP door panels in the UK using the latest infusion technology. Unlike older injection techniques, infusion relies on vacuum pressure to draw resin through the part, removing any excess resin that may exist resulting in a lighter and stronger panel. 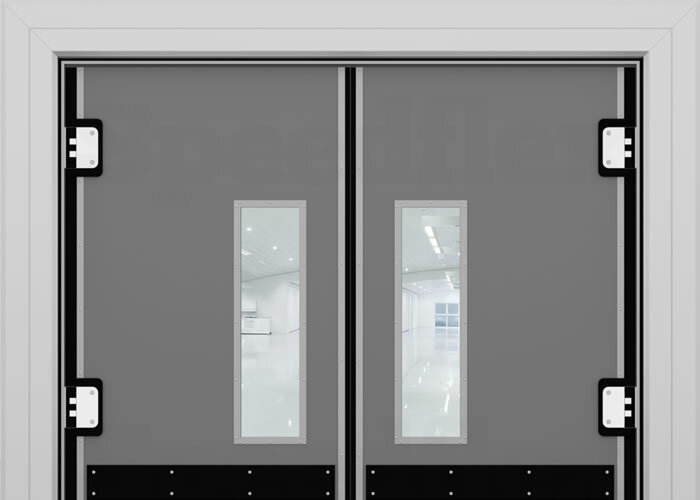 Alongside our GRP traffic doors, Speedflex are the first UK manufacturer to manufacture a seamless GRP fire rated door which uses specially formulated fire retardant infusion resins. For further information on our GRP products please contact a member of our sales team for further information. A choice of high quality Inox Stainless Steel 180 degree and 270 degree swing hinges are available as standard. Additional options such as auto-close and hold open are also available on request. 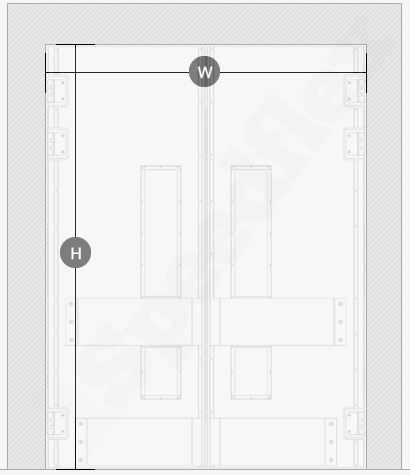 Optional heat draped polypropylene or food safe HMWPE and UHMWPE door bumper options available on all impact doors.